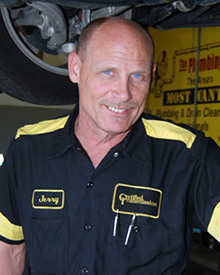 Jerry Huerter is an ASE certified Master Technician and has over 35 years of experience in the automotive industry. He is currently working at Certified Transmission’s Overland Park KS facility diagnosing vehicle problems. His years of experience make him a great asset to the company and its customers. Our story begins with a 1995 Chevrolet K1500, 6.5 Diesel with a 4L80E transmission that was brought into our shop by one of our wholesale customers. The customer had replaced the transmission in this vehicle with one of our remanufactured units. After doing so, the customer stated that the check engine light came on and was setting multiple transmission codes, and that when going around a left-hand turn the transmission would neutralize. I began my diagnosis by checking the fluid level and scanning for codes. The fluid level checked okay. Upon scanning system I found four transmission codes: 72, output speed sensor; 83, torque converter quad driver module; 82, shift solenoid ‘A’ circuit, and 81, shift solenoid ‘B’ circuit. I then cleared all codes to prepare to take the vehicle for a test drive. After clearing the codes and the engine turned off, the solenoid codes would immediately reset. Upon starting the engine, the communication between the scan tool and the PCM would be lost. Even though there were codes set and no communication with PCM, I decided to go for a test drive. I was expecting second gear starts and no shifts, but to my surprise the transmission shifted properly through all of the gears. Also, I did not experience the neutralizing around the left-hand turn that the customer had complained about. After returning to the shop, I again checked for codes (without the engine running) and found that the solenoid codes 82 and 83 where still present, and that code 83, torque converter quad driver module, had returned. Based on this information, I suspected PCM failure. After replacing the PCM the check engine light went out, and the transmission solenoid codes did not reset. Problem #1 solved! However, upon starting the engine again the scan tool continued to lose communication with the newly installed PCM. After reviewing the wiring diagram I saw that the air bag module shared the data line with the ECM at the DLC, terminal M. I also noticed that the air bag light was on in the instrument cluster. When I tried to scan the air bag module it would not communicate with the scan tool with, or without, the engine running. Now I’m thinking that the air bag module is defective so I removed the fuse and now the scan tool could then communicate with the PCM when the engine was running. Problem #2 solved! With the second problem resolved I still hadn’t been able to experience the customer’s complaint regarding the left-hand turn neutralization. With the scan tool now able to read data, I went for an extended test drive making as many left-hand turns as possible. Upon making a long, sweeping, left-hand turn, the engine flared, the transmission locked into a lower gear and the check engine light came on. The code 72 vehicle speed sensor was set. I cleared the code and again made the same left-hand turn, at the same speed. With the same results as before I confirmed that the left-hand turn is in fact setting the code 72. Once again, making the same left-hand turn, with a lab scope installed, the VSS signal on the scope would drop out and the transmission would default to second gear. Now that I had duplicated the customer’s complaint, I knew that during a left-hand turn the VSS circuit was being compromised. Armed with this information I began looking for anything that might be moving or shifting during a left-hand turn. Since the VSS is located at the rear of the transfer case, that is where I went to begin tracing the wiring harness. I followed the wiring harness along the left side of the bell housing, over the fuel line bracket that was located close to the pinch weld seam of the truck cab. I inspected the wiring harness at the pinch weld location and found the pinch weld rubbing on the harness. When making a left-hand turn the truck cab would shift to the right and ground the VSS circuit. I repaired the wiring harness and rerouted it away from the pinch weld. Problem #3 solved! The PCM failure may have been related to the shorted wiring. This case was unique, because there were multiple issues that created a common concern. It also demonstrates the importance of a complete, thorough diagnosis. In this age of the automobile, electronics play a dominant role in the control and well-being of our powertrain components, and one issue begets another. In the end, this was a successful repair and the customer left the shop happy.